I think you missed inserting what you are asking about. I installed a similar product. So far I like it. The deck stays cooler, non-slip and cleans up well. I used a product called Seadek. Really pleased with it look in my photos to view. viewtopic.php?f=24&t=10723&p=74827&hilit=Seadek#p73734 For a thread on it. While at the boat show, we happened by the SeaDek booth. The look and feel seemed identical to Raptor deck. When I mentioned to the SeaDek rep that we were looking at Ranger Tugs, and they use Raptor deck, he said they are basically the same and equally good products. He seemed like a stand-up guy who didn’t try to gratuitously bad mouth the competition, which left me a good impression of SeaDek as a company. Raptor uses Ultralon Foam. The Ultralon product is U-Dek that Knotflying and myself installed on our boats over a year ago. There are pics in my photo album. The U.S. distributor for Ultralon is located in Rhode Island. Brian, is it fair to say you’ve been happy with how the product has held up? Following just so I can remember Raptor Mat. I’ve used SeaDek on several of my wakeboard and slalom boats, and it’s fantastic stuff as long as you take care of it and watch your ski fin on it! One thing to watch out for is when dirt gets worked under the edges...it can really creep under there once it gets started, so keep an eye on that and if it happens clean it and shore up the adhesive. If Raptor has the patterns for CW’s and Rangers, that’s a huge leg up. Making the patterns can be a little tricky. Thank you all for the feedback! It was very helpful. 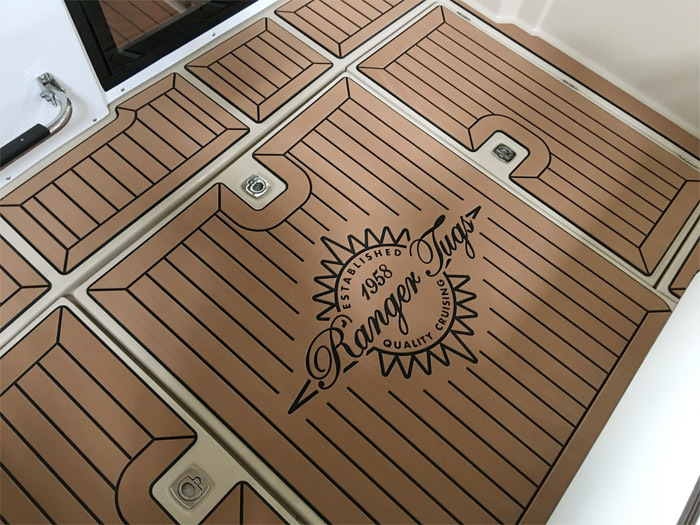 I am going to order the Raptor Deck and hope that I can install is properly. This was on a Cutwater 28 at the Seattle Boat Show last week. I also visited the Raptor booth and I was very impressed with their people. I’m leaning towards doing this on my boat but use the black color in the gaps instead of the ivory color. Will this product be OK with scales, blood etc from fish? How easy is it to clean? Non-Ranger Model: Dinghy "Tiny Bubbles"
I installed SeaDek on our previous SeaSport. It was a great, closed-cell foam product that cleans up well with a soft bristle brush and soap. I will tell you, although comfortable underfoot, this product does not like abrasion impacts. So where would you be likely to have such items onboard, you ask. Shrimp pots and crab pots! Have a protective mat or otherwise use care to avoid gouges in your mat when handling these and like items. Joan and Jim wrote: Will this product be OK with scales, blood etc from fish? How easy is it to clean?